Have your children help you come up with movements to act out the words of the Bible verse as they say them. See who can do the movements and say the verse the fastest. For example, if God is one of the words in the verse, you might point to heaven for that word. Divide your children up into groups and have each group come up with a song using the words of the Bible verse. 1. Before class make sets of Bible verse cards with one word of the verse on each card. Fold up the ends of the cards so that they will be easier to pick up with chopsticks. 2. Divide the children into teams and spread out the cards on a table. Place teams at the other end of the room. Children must relay race to the table to retrieve a word card using only their chopsticks. The team that retrieves all its cards and places them in order to spell out the verse first wins. 1. Before class use a word processing program to print the words from your Bible verse. Use a different font for each word of the verse, make the words at least an inch high. After you have made all the words for the verse and printed them out make a copy of the words and then change the words to words that are similar. For example, if you have the word "face" in your Bible verse, you can change the "f" to a "t" and make the word "take". Do this for all the words in the Bible verse at least two times. Print out all the words. Make sure you don't use the Bible verse words more than once unless they are used more than once in your Bible verse. 2. After you have printed out all the pages, cut the words apart. 1. In class place all the words face up, spread out on a table. Remove all the chairs from around the table and have your children stand around the table. 2. Read the verse and then tell your children that you are going to have a contest to see who can find the most words first from the Bible verse. Tell them that the first word of the verse is "make". Let's see who can find the word "make" first. When a child finds the correct word he or she gets to keep it. 3. Then tell the children the second word and see who can find that second word. When you have gone through all the words, have the children count how many words they have found to see who collected the most. 4. Play the game again to review the verse again. Have the children place all the words back on the table and mix them up. Ask the children if they remember what the first word of the verse is and see who can find it first. If you have very young children, you can show them what the word looks like before you have them look for the word. Before class print out more than one copy of the verse. To make it easier for young children, you can also just print the words from the verse and not use the extra words. Once all the Commandments are memorized you can use them as a game. Break up your students into teams and give each team a set of cards. Mix up the cards and have the teams read them and place them in order. The team that gets them all in order first wins. Order the Ten Commandment cards from Memory Cross Inc. web site. 1. Pick four Bible verses that you want to review. Count the words in the longest Bible verse and stack that many cups. 2. Numbers the cups so you know the order of the cups. Write the numbers on the bottoms of the cups. Note: You can also tie the cups together by punching holes in the bottom and tying them together with a string with a knot at both ends. Place tape on the bottom of the cups before punching holes in the bottoms to reinforce the holes. 3. Mark four points opposite each other on the bottom of the top cup so you can see them from the side. This will help you to know where to write the words. Tape the cups together down one side so that the cups don't move while you are writing on them. 4. Write the Bible verse reference on the top cup, and then write the words from the Bible verse one on each cup from top to bottom. 5. 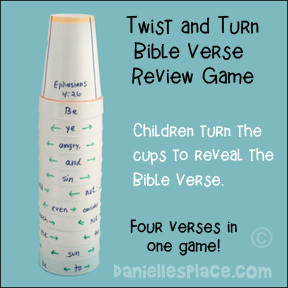 Turn the stack of cups to the opposite side and write another Bible verse reference and the words down the side. Write two more Bible verses half way between the two Bible verses uses the marks at the bottom of the top cup as a guide. 1. Give your child the stack of cups. Tell him to pick a Bible verse or assign the Bible verse. 2. On the word "go" the child should turn the cups to line up the words to the Bible verse as fast as he can. Time the child to see how fast he can line up all the words. Tell him how long it took to line up the words. 3. Turn the cups so the words are mixed up again and challenge him to try again to beat his time. Before you start test to see how many cups can be stacked on top of each other and still stay standing. Stack the cups so that two bottoms are together and then two tops. The cups I used would only allow five cups before they became to tipsy. Before class write words from a Bible verse that you are memorizing on the cups so that when you stack them they are in order. Write the words so that they are right-side up when the cups are stacked. You can also use this game to review the books of the Bible. Give each player or team a set of cups with the words on them. On the word "go" see which team can stack the cups in order first without any of the cups falling off. In class give each child a set of chopsticks and divide your children into teams. Line up each team. Spread out the words in front of the first person in line of each team. The first child in line passes the words to the second person in line and so on until the word reaches the end of the line. The person at the end of the line puts the words in order to spell out the verse. Children can use only one hand to use their chopsticks to pick up the words and pass them. The team that has all the words in order first wins. You can also play this game as a relay race having the children run up to the set of words, pick up a word with their chopsticks, and then run back with the words. When the first child returns the next child in line takes a turn. 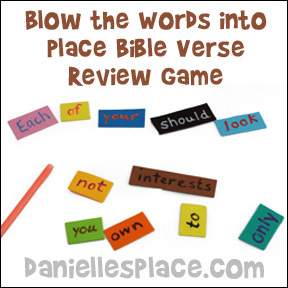 You can use this game to review Bible lessons or memory verses. 1. Before class prepare questions from the lesson (Bible verse) by writing them down on strips of paper. Fold or roll up the strips of paper. 3. Mix up the cups by shoving them around on the table until the children aren't sure which cup has the verse under it. 4. Call on a child to guess which cup has the verse. If the child guesses correctly, open up the paper and read the question. If not, have the child keep trying until he finds the right cup and answers a question. If you are reviewing a Bible verse, have the child say or read the Bible verse when he or she picks the correct cup. Play like hangman but use only the books of the Bible. Printed out the verse on paper with all the vowels missing. Children try to figure out the verse by adding vowels. Print the verse and then flip the words so that they are backwards using a word processing program. Have your children try to figure out the verse. Print out the verse and then change the spacing between the letters putting some words together and separating letter in the words. Have your children try to figure out the verse. Print out the Bible verse onto card stock so that it covers the entire page. Cut up the page into one-inch strips and mix them up. In class have your children try to put them in order. 2. Write one word from the Bible verse on each craft foam piece using a permanent marker or liquid chalk. Write the same word on the back and front of the craft foam piece. Make a set for every child or have the children share them. 3. Write the Bible verse on the board so everyone can see it. 1. 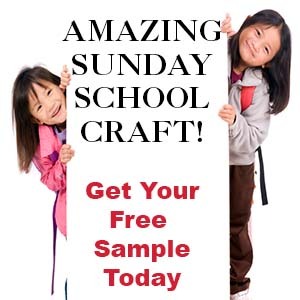 In class review the Bible verse, and then give each child a drinking straw and a set of craft foam shapes. 2. Instruct your children use their straws to blow the words into place to spell out the Bible verse. Tell them that they may not touch the foam pieces with their straws. 3. Time each child to see who can complete the Bible verse in the shortest amount of time. Before class decide what is the most important part of the Bible verse. Pick six words from the verse. Write the words on dot stickers and place each word once on all six dice. To make the game easier use a different color dot sticker for each word. Place all the dice in a plastic cup. Children take turns trying to get all the words in order by throwing the dice. To play a child shakes up the dice in the cup and throws them out on the table. He puts the words in order to make the verse. The words that cannot be used to make the verse are placed back in the cup and he must shake them up again and throw them out. He then sees if any of the new words he has thrown will fit into the verse. Any dice that don't have the correct words are placed back in the cup, mixed up, and thrown again. The child keeps throwing until he makes the verse. The teacher keeps track of how many throws it took the child to make the verse. The child with the least amount of throws wins. Have your children come up with motions to go along with each word or phrase of the Bible verse, something that will remind of the word or phrase. For example, if the word God is in the verse they might decide to point up towards heaven. See how fast they can do the motion and say the verse.